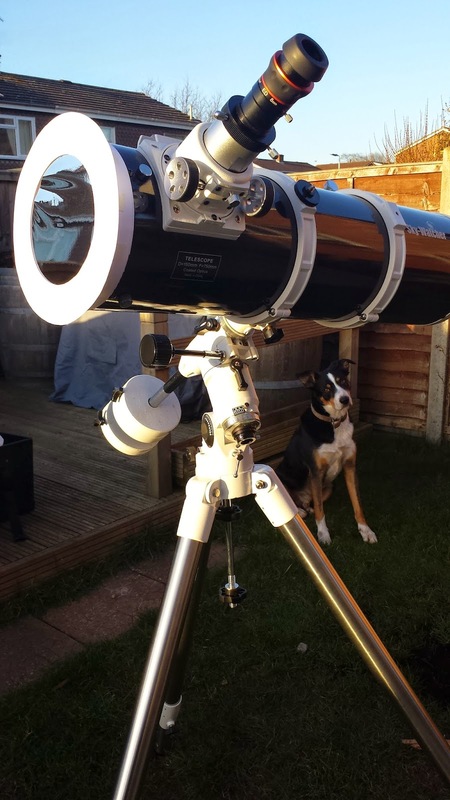 As seems to be the trend with amateur astronomy, where people can, they employ a degree of DIY to try and bring down the cost of the potentially very expensive hobby. So, I've followed in the foot steps of others and started down that road too. First upgrades to the SBT. 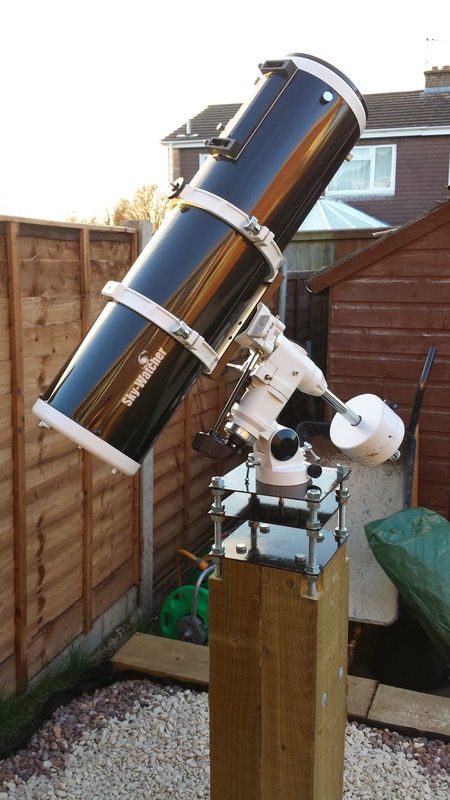 I've recently taken delivery of a Skywatcher Flextube 300p dob. Though the build process is documented on this page I carried out some out of the box upgrades that I think were worth doing straight away. The first of which was to remove the primary collimation screws and replace them with some knurled thumb screws. 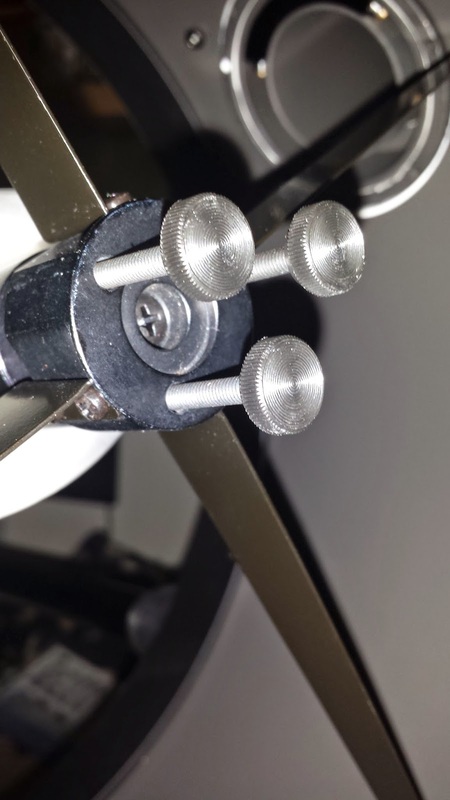 Similar to the famous Bobs Knobs, these collimation screws make collimation a much quicker process, and something that can be done in the dark without the fear of dropping an alan key down the tube onto the primary mirror. My first impressions are that the screws, though listed specifically for the 300p, do seem a little long. I think I will leave them for the time being, and perhaps shorten them if they prove to be detrimental. My second upgrade, or, change to the scope was fitting a new Telrad base to the scope. I have used a Telrad with my 150p and really like it. I have removed the foot bracket of the supplied finderscope and packed them away. In its place, I attached the new Telrad base ready for the Telrad to be fitted ready for first light. 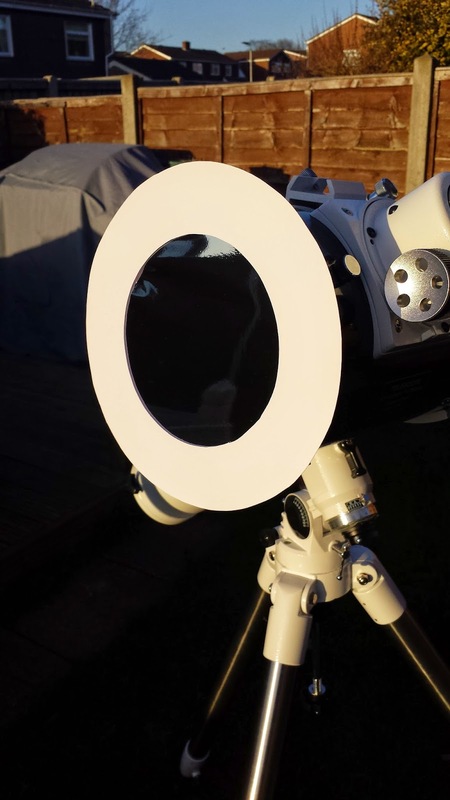 With the partial solar eclipse scheduled to grace our skies later this month, I decided that it would be an idea to make my own solar filter to fit on the front on the 150p reflector. To do this, I bought some Baader Solar Filter Film as I had read in various forums that this was about the best way to go about building the filter. Though there are pre-made filters available on the market, I was up for the challenge. The film arrived, and I read the instructions on how to make the filter, but they didn't seem to make much sense. So, it was time to blag it. The structure of the filter itself was straight forward to make using some card, masking tape and double sided tape. Cut 4 strips of card, 1 inch wide and long enough to wrap around the end of the scope. Take the first strip and secure it into place with small pieces of masking tape. Attach a length of double sided tape around the strip of card, ready to attach the next layer. Take the next strip and cover the first, sticking it into place onto the double sided tape. Repeat these steps until all 4 strips are in place. Measure the aperture of the end of the scope and add 2 inches. Using another piece of card, cut out two circles with the diameter of the scope, plus the two inches. So, in my case, the scope is 6 inches in diameter, plus 2 inches gives me two circles of card 8 inches in diameter. On the two circles of card, draw a smaller circle approximately 5 1/2 inches in diameter in the centre. Cut out the smaller circle leaving you with two "polo mint" shaped pieces of card. Take one of the circular pieces of card, and around the inner edge, attache double sided tape. Stick the circle of solar film over the inner hole of the circle of card. Attach more double sided tape around the edge of the circle of card on the same side of the filter. Using the second circle of card, sandwich in the filter film using the double sided tape to stick it in place. The front part of the filter is now complete. Remove the bands of card that were built up around the end of the telescope in the first steps. Position the card band centrally on the front part of the filter and secure into place using pieces of masking tape. That should be the filter more or less complete. At least, they are the steps I went through! Anyway, here it is attached on the front of the 150p. 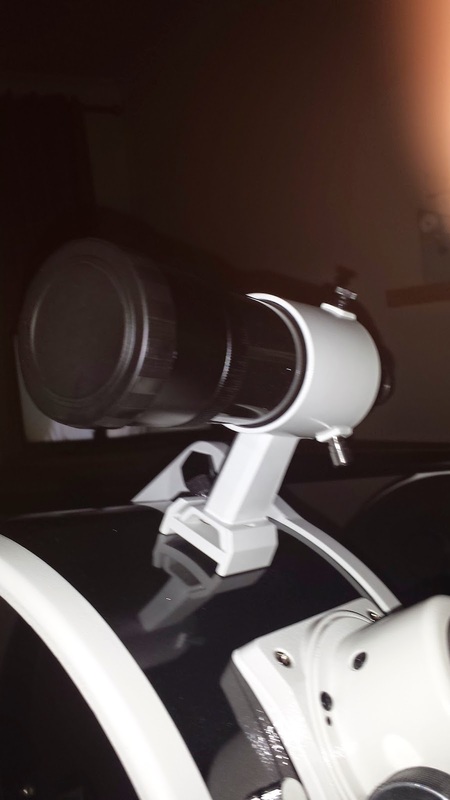 When the filter is put onto the front of the scope, it's worth using a few pieces of masking tape to hold it in place and attach it to the telescope. 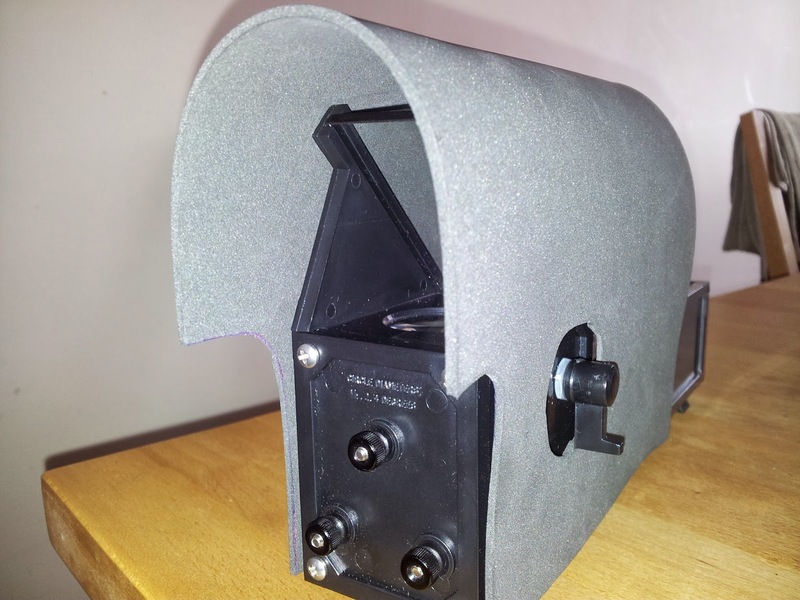 Just in case a gust of wind lifts the filter off the scope, or if it gets knocked off whilst you are standing at the eyepiece. Fed up with spending time wiping down the Telrad glass, I thought it an easy project to tackle. I cannot claim to have come up with the pattern or design myself, but it is freely available to download, and the original designer makes it available for all from here. So a trip to Hobbycraft to buy the materials have resulted in something suitable. Materials used were an A4 sized piece of thin foam, and 8 circular Velcro pads to adhere it to the Telrad. Following the design it was a 10 minute task to mark out and cut out the shape required, Very simple, very clean and not much more to say about it really. This had been playing on my mind for a while. I always thought that the next move for me was to design and build some sort of permanent mount in the garden to cut down the amount of time that it takes to set up for viewing each evening. A home obsy is out of the question at the moment due to space constraints. 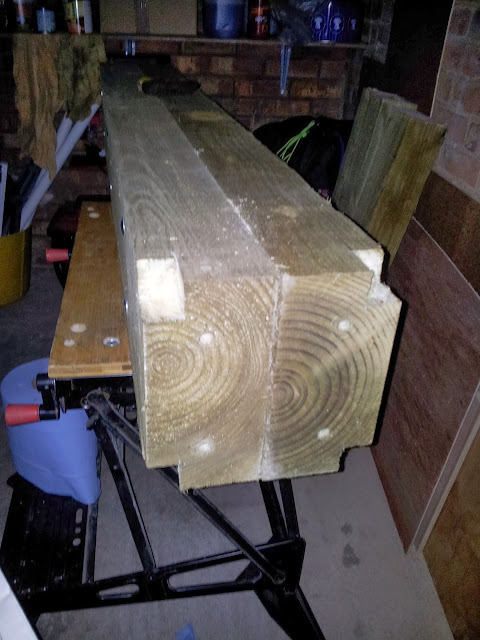 I thought about a number of different solutions, A concrete pier, a steel pier, but then I came across this thread on the Cloudy Nights forum for a member creating a wooden pier. That idea stuck with me for a while. I carried reading up on all the advice and thoughts of other people and it seemed that the consensus that for the likes of astrophotography, and when using heavy scopes, wood wasn't the best material to use. But, in support of it, my scope is mounted on an EQ 3-2 mount and is fairly light in comparison to many others on the market. Also, aesthetically, I think a wooden pier will look much better that some sort of painted concrete or steel construction. With a half idea that my next scope is going to be a Dob anyway, I developed the idea. I had a week in London for work which gave me plenty of evening time to come up with an adaptation of the design on cloudy nights which would suit my needs. Thinking through the process, I started to think what I could use and established that the mount plate where the EQ mount would be sitting was perhaps going to be the trickiest section to get right. I knew my pier would not need to be as big as the design on Cloudy Nights, so I started looking for suitable timber and steel. First, the timber. I wanted something quite substantial, and preferable something that had been treated. I dismissed reclaimed timber due to the pot luck nature of what you could get. So, after a bit of a search, I came across new railway sleepers which were pre treated and have a cross section of 100mm x 200mm. Two of these bolted together will give me a square surface area of 200mm x 200mm. I worked out that the top of the wooden section of the pier needed to be 860mm above the ground. 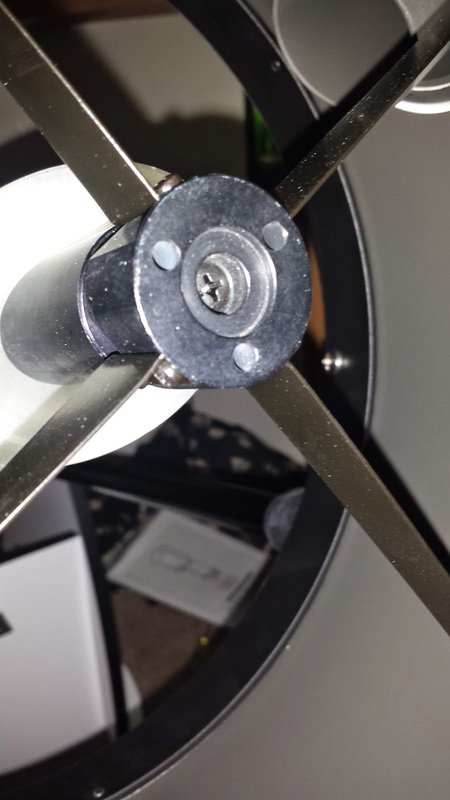 The rest of the pier height could be made up of the mounting adapter plates. That leaves me with approximately 650mm to bury in the ground and encase on concrete. Again, referring to the Cloudy Nights design, I liked the method in which the designer had created the method of attaching the base plate to the top of the wooden section of the mount. So, the relevant notches from each corner were removed and the holes drilled for the steel plate. The intention is now to use as much timber preservative as possible on the section of the pier which is going to be buried under the ground level. The above ground section I think will be left natural, so I think I will use decking treatment which preserves the original finish as much as possible. So, that's the progress on the wooden section. Now for the steel plate and the EQ mount adapter. Given that I had a 200mm square section to utilise, I was keen to keep anything on top of the pier to that size to avoid any sort of overlap. I source three pieces of 3mm thick steel plate from a local fabricator for £15. That included a hole of 62mm diameter cut for e in the centre on one of the pieces. Armed with the three pieces of steel, I then drilled a hole in each corner of the steel plates which will be used to attach the plates together. A further four holes were drilled in the plate which will be attached to the top of the wooden section. And finally, a single 10mm hole drilled in the middle plate which will be used to accommodate the bolt used to attach the EQ mount to the plate. 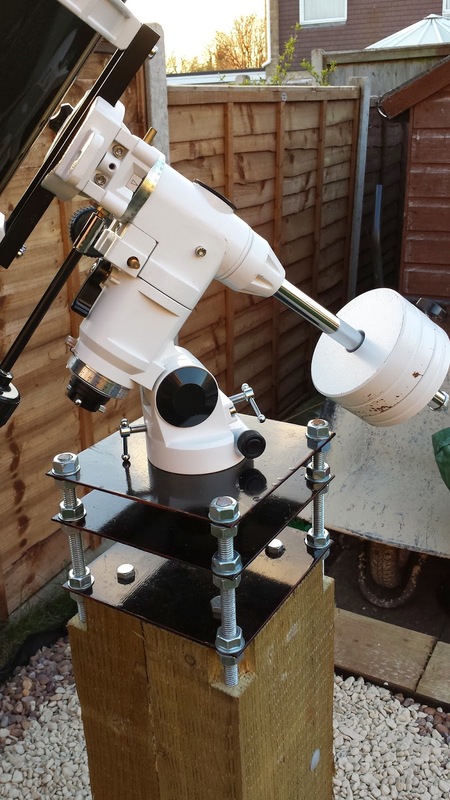 The idea of having these plates is to be able to attach the EQ mount to the pier, whilst maintaining a level and allowing correct polar alignment to be kept at all times. The steel plates have now been painted with black metallic paint. 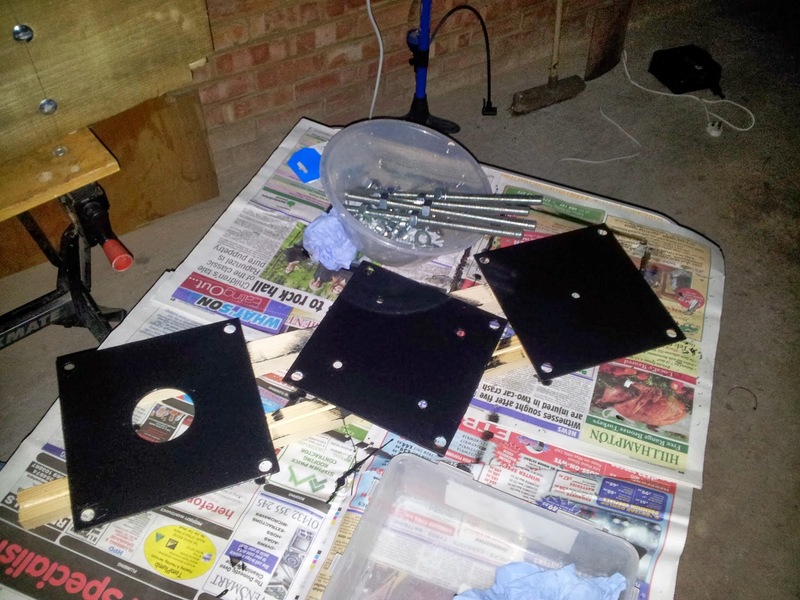 The steel plates have had their third coat of black paint. They are now complete and ready to go. I've also treated the section of pier which will be underground. To do the top section which will be exposed to the elements, I will use the decking protector which I already have in the garage. Hopefully I will be able to do this before starting back in work in the new year. Just need to source some paving slabs. sand and postcrete mix. That's when the dry weather will really be needed! Well, there is no way to describe the weather we have been subjected to over the last 3 to 4 weeks other than 'damp'. I think that about covers it. So, today, with the first clear blue sky day for a while, inspiration took hold, and work continued. When I last updated, the pier was together, the steel had been painted and that was about it. 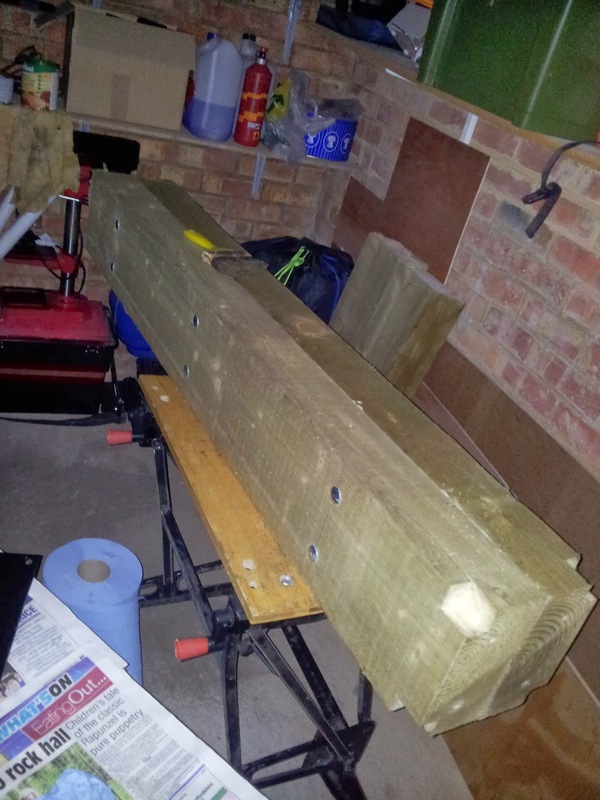 Since then, I have also added 3 coats of fence panel/wood preservative up to 650mm from the bottom of the pier. So, today, I looked at how much I could achieve in the good weather. And then, a last minute change of mind. Up until this morning, I was intent on using paving slabs and laying a good base around the pier. But, being impatient as I can be, I decided on a gravel base instead. Much easier to put down, and a whole lot cheaper. I marked the area out where the pier needed to be and I started to dig. The hole was 2 spade widths square and went down the required 650mm. Then off to the shop. 3 bags of ready-mix postcrete. 10 bags of 20mm shingle. 2 1 meter lengths of rebar. Firstly, I dropped the pier into the hole and using the sleeper off-cuts I was able to hold the pier into a vertical position ready to drop in the ready-mix around the base of the pier. I dropped in one bag and a couple of litres of water, left it for 5 - 10 minutes and then dropped in the next one, more water and another wait and then the final bag went in. That was enough to bring the mix level up to about 2/3 of the depth of the hole. In between each bag going in, I rammed in the rebar around the pier to make sure the water was getting mixed through and pop any air bubbles left in the mix. 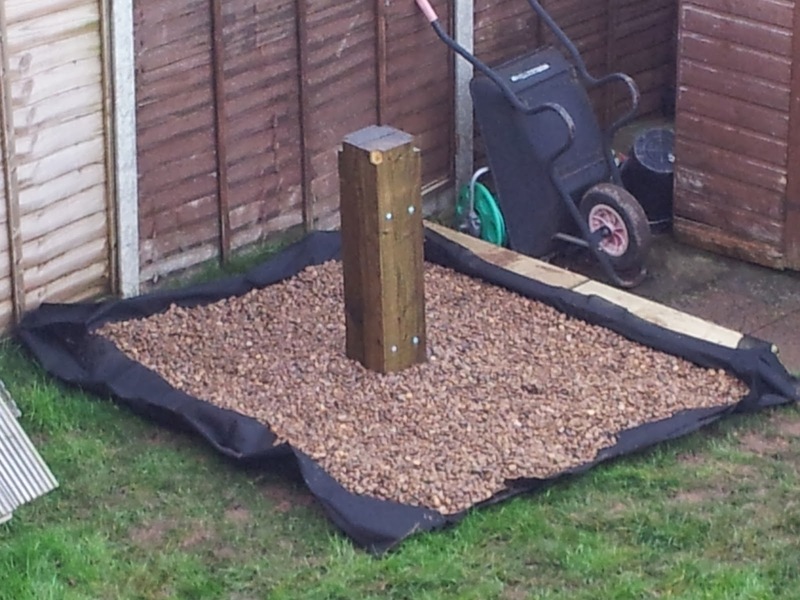 So, pier now set in quick dry concrete, I the turned my attention to the area around the base. Using the two offcuts of railway sleeper, I created a raised front step to act as a barrier to avoid losing the shingle from the base. I drilled a couple of holes in each piece, cut the rebar lengths in half and then drove the four piece if rebar through the holes into the ground underneath to hold the sleepers in place. That complete, the weed membrane was cut to size and offered up around the pier before the shingle was then laid on top. Finally for the day, I then used some left over decking protector to paint the pier which was left above ground. Even though the pier was already treated, it wasn't going to harm to give it another good drenching of preservative. Before I finished for the evening, I gave the pier a bit of a thump and it is more solid than I thought it would be with very little in the way of movement. For my 150mm reflector and casual visual observing, it's more than adequate I would say. Also, if I ever bought a larger OTA, possible 200 or 250mm, I think it would still suffice. And so the end of this mini project is in sight. Buy two fence posts 100mm square which will be laid down to create an edge along the side of the gravelled already bordered by the lawn. Make a couple of wooden stakes to hold the fence posts in place. Trim the remaining membrane to tidy it all up. Attach the steel plates and mount adapter to the top of the pier. Finally, make some sort of cover to drape over the top of the pier when it's not in use. A bit later than anticipated, for in truth I finished this a couple of weeks ago but only now do I have the time to finish the article off. All points above have been completed and the final construction has taken place. So, here we have the three pieces of steel plate bolted together on top of the pier. The bottom, or base plate is bolted to the wood with 4 large diameter wood bolts. I then needed to position the middle plate high enough to allow me to fit the fixing bolt for the mount underneath it. Finally, the top plate was put in place and leveled according to the bubble on the EQ mount. And the last picture shows it all brought together. 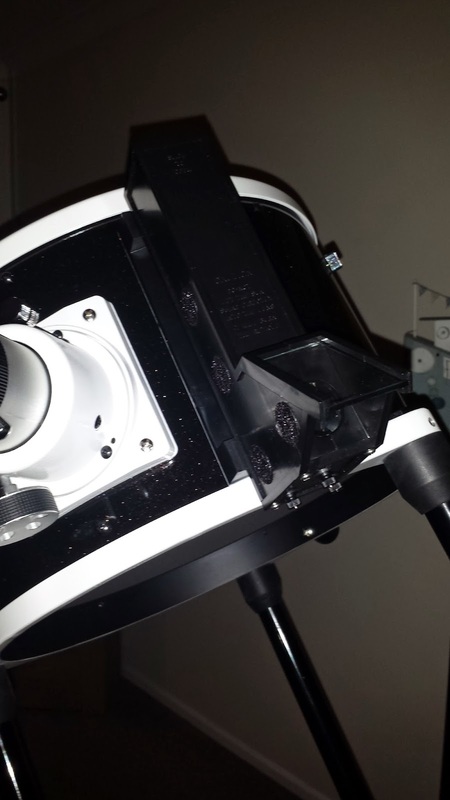 Now, the whole purpose of this project was to make setup time much quicker with the intention of leaving the mount outside. But, I needed it to be kept protected from the weather. In order to do this, I have decided to go with a two layer cover. The first provides a 100% waterproof cover in the for of a heavy duty polythene rubble bag. It's ample big enough to fit over the mount and weights all in-situ. Then, on top of that, I have bought a garden chimenea cover with a zip down its length and ties around the bottom to help hold it into place. Whilst this layer is not 100% waterproof, it keeps the worst of the weather away.